At The UKs Dog Lead Shop, we’re proud to have been offering the highest quality premium dog leads to UK pet lovers for over 10 years. We offer a vast selection of rope dog leads and braid leads for dogs, and carefully consider all scenarios to ensure we’re stocking the finest and most purpose-fit products. We have extra long leads, double-ended clip leads, and even over-shoulder leads. We care deeply about the safety, security, and comfort of all breeds of dog and are only happy when we’re providing the right lead for the job. Our expertise doesn’t only stop at dog leads – we’re a leading stockist of many other high quality dog accessories too. Alongside leads we also offer premium dog collars, with rope slip collars, braid slip collars, and tuck and stitch collars on offer for your favourite pooch. 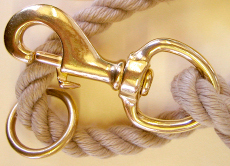 Our specialist products – including toys, dog whistles, and lanyards – have been carefully selected and tested to ensure they don’t fall short of even the most stringent requirements. Why is a good dog lead so important? Shockingly, a family pet is lost every two seconds. Only one in 10 pets are reunited with their families, and the other 90% are never found. There are many ways to keep your pets safe and to avoid them being lost or running away, and one of the best solutions is to ensure they have a reliable lead to keep them away from dangerous scenarios. It’s no secret that dogs are just as much a part of the family as anyone else, which is why their safety and comfort is of paramount importance in the big wide world. As dog lovers, we pride ourselves on our ability to provide our customers with leads that we would walk our own dog with, and that means materials that avoid any discomfort and irritation, and careful construction to guarantee the safety of any pet under our watch. Whether you’re looking for slip leads, clip leads, training leads, or double dog leads, we have the best selection of tried and tested dog leads UK and all of our KJK products are regularly recommended by professional dog trainers, dog clubs, kennels and breed societies. We’re exceptionally pleased that the recognition for KJK leads even extends to the RSPCA and police dog trainers, who are renowned for being particularly rigorous with their safety standards. If the safety of your pet and those around you is of the highest importance to you, look no further than our collection of superior dog lead products and accessories. 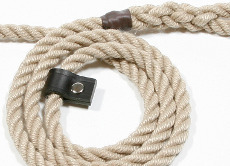 Our range of rope leads are made from top quality marine rope and are hand spliced. We do not use metal crimps or simply melt the ends of the rope together like other low quality leads. 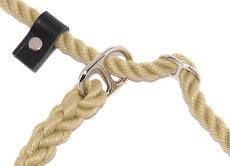 You can choose from a variety of different rope diameters, lengths and colours to suit any dog and their owner. Our braided dog leads are bar-tacked (a tight line of 42 stitches) for a reliable finish you can depend on. We also have a range of reflective leads and collars that shine in car headlights from 200 metres away; keeping you and your dog safe from dusk 'til dawn. For that extra something special, we offer an upgrade on most of our products to include brass fittings. Remember to tick the "Brass Fittings" tick box before adding to your cart. 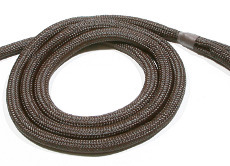 We have recently added double stop slip leads to our product range. These offer the control benefits of a slip lead without the worry that the slip will close too tight around your dog's neck.